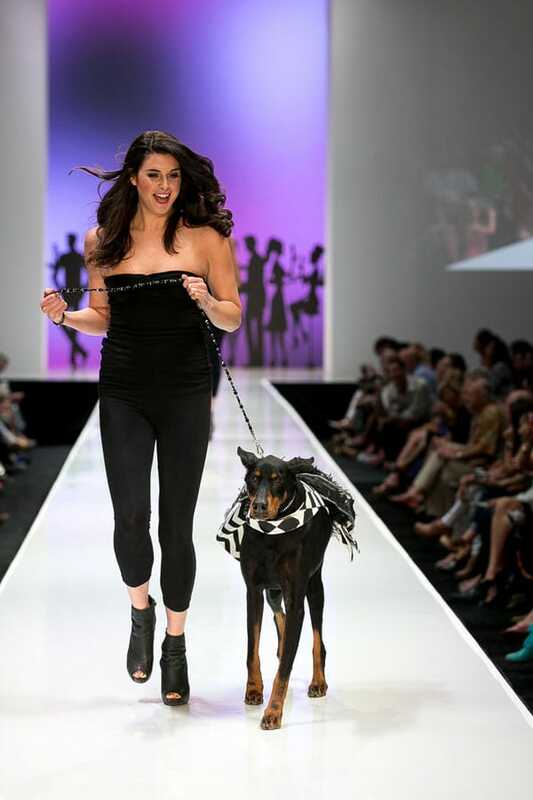 There were plenty of snouts in the Big White Tent during Fashion Week El Paseo’s Le Chien Couture Fashion show, but the Saturday night event was anything but snooty. 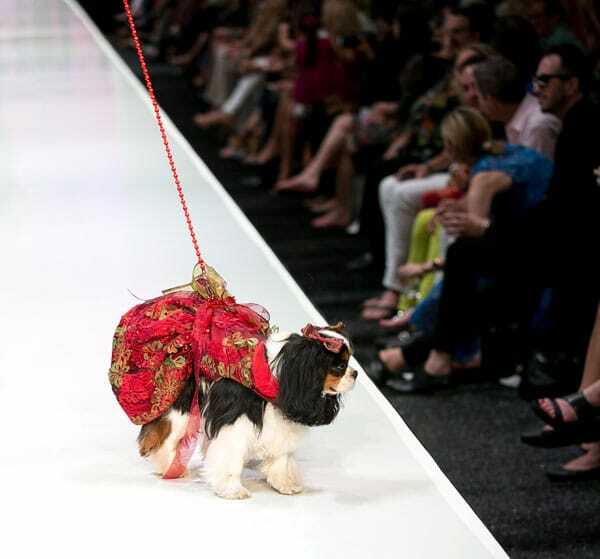 After a video depicting the plight of abused, neglected, and abandoned dogs tugged at heartstrings, the solemn mood turned festive. 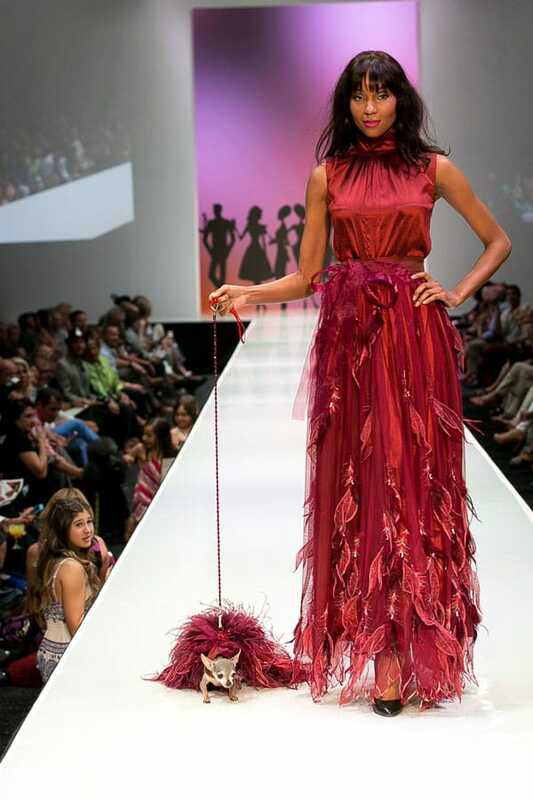 People clapped and cheered for their favorite canines; kids crammed the side of the runway for a better look—and no one shushed them away; and the human models walking the dogs wore bright smiles instead of the more standard seductive intensity. Starting things off were dogs available for adoption at the Humane Society of the Desert Orphan Pet Oasis— the largest no-kill sanctuary in the area and the recipient of last night’s fundraiser. 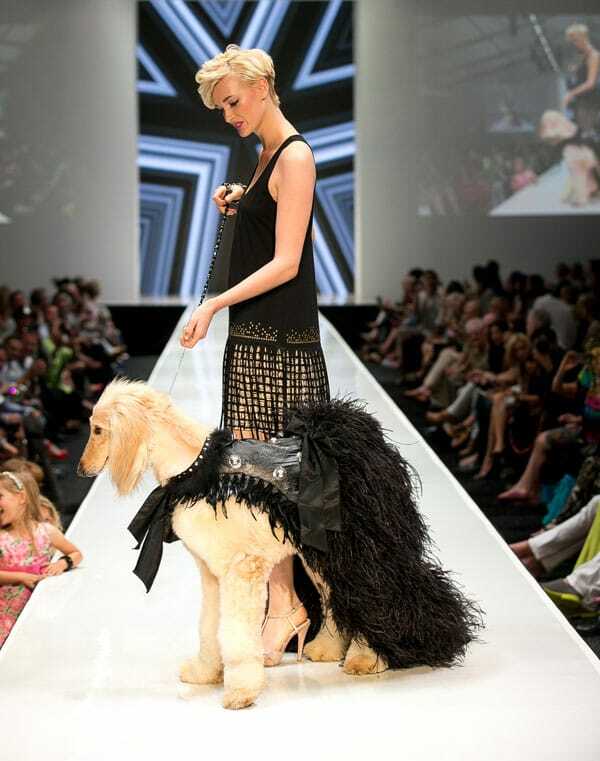 Chica stole the show from the get-go and didn’t even have to raise a paw. 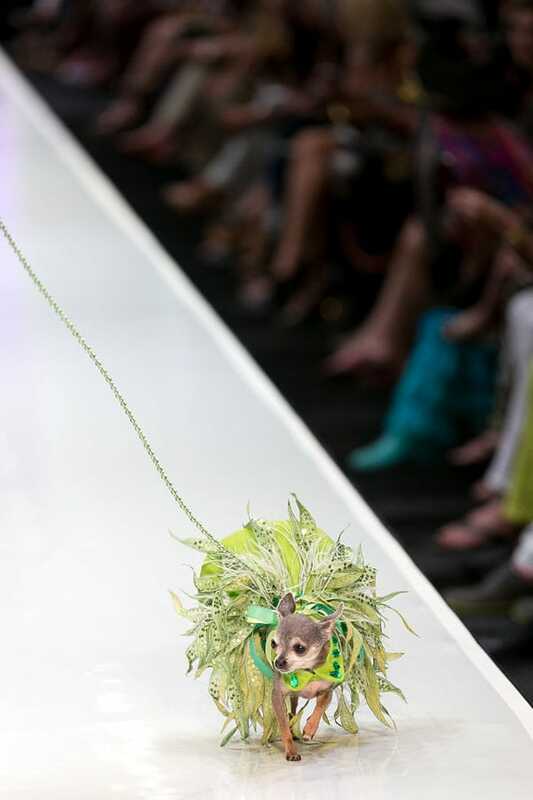 The three-month old dachshund/Chihuahua was so tuckered out from hours of prepping and schmoozing that she slept in the arms of her human handler through most of her runway debut. 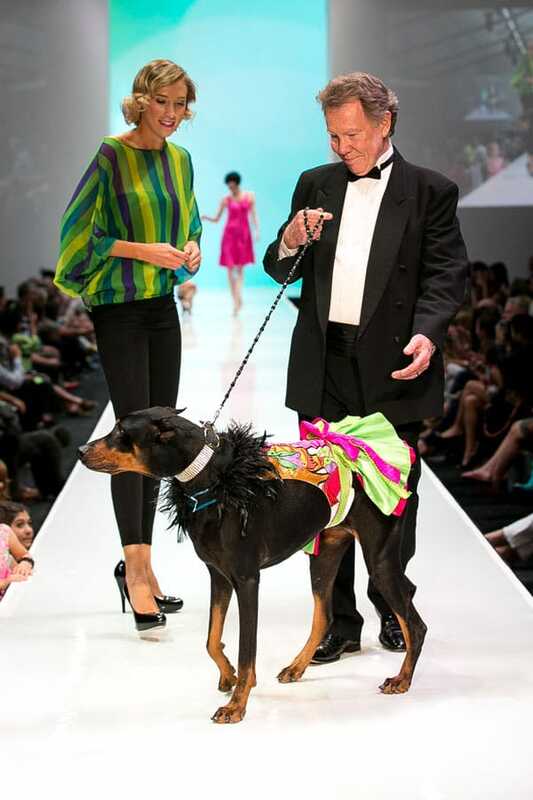 In its second year kicking off Fashion Week El Paseo’s opening weekend, Le Chien was bigger and better than in 2012, raising more than $40,000 — half of which came from one man, Scott Sangalli, who twice bid $10,000 during the live auction for a luxury club car golf cart signed by Bill Clinton and twice immediately returned it for another round of bidding, ultimately resulting in a final take of $31,500 for the car. 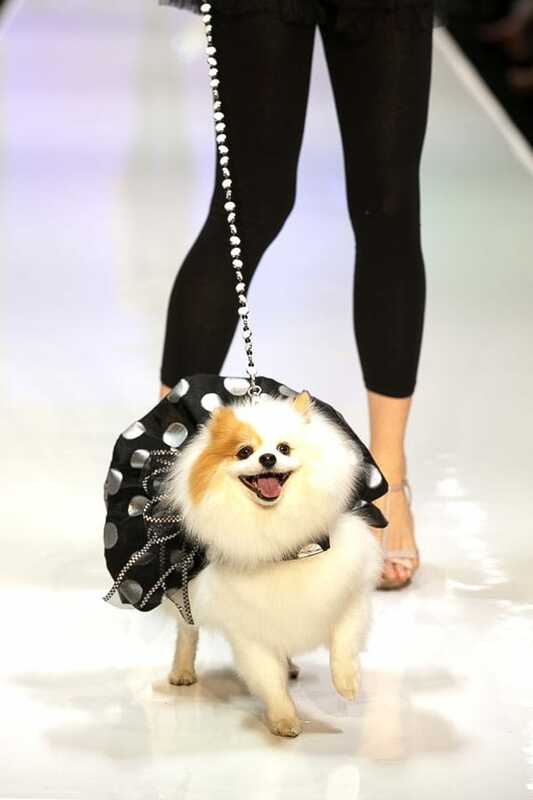 Highlights of the fashion show included an Afghan hound in a black studded biker garb, a posh Doberman in a sharp black-and-white op art print ensemble. 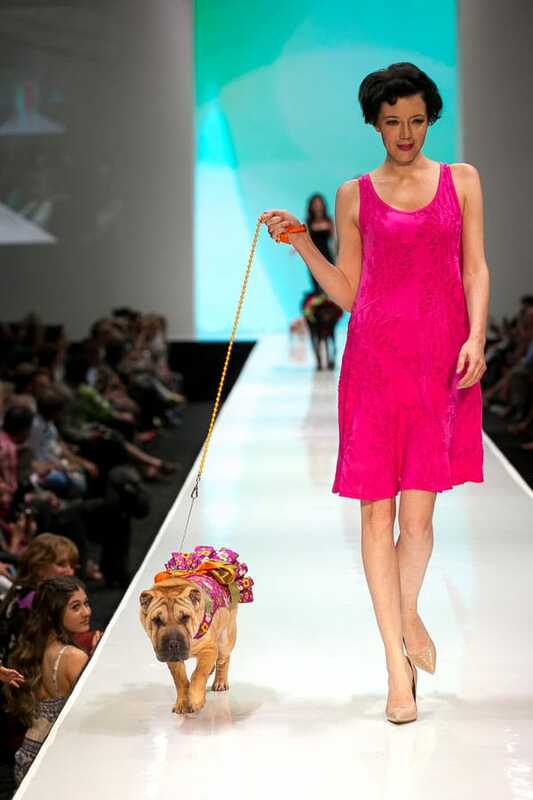 And a shar-pei in hot pink and orange, who really knew how to work some wrinkles. 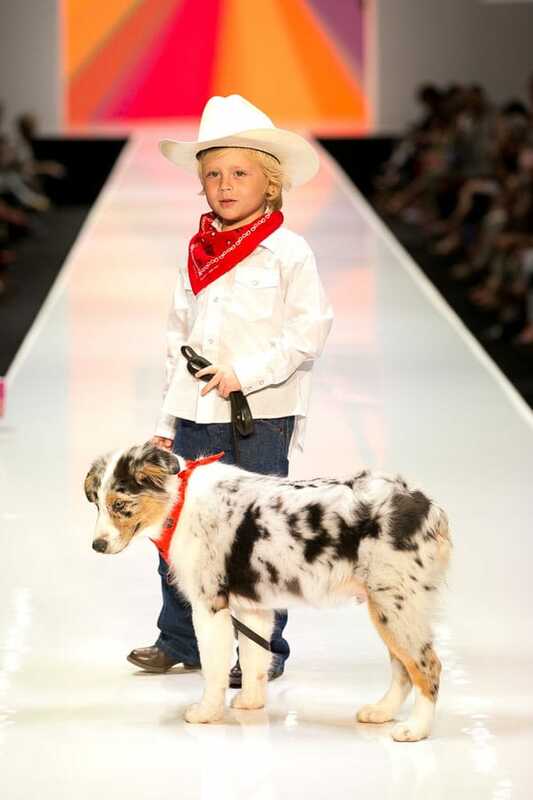 On the human side, 5-year-old Asa Carmen stole the show in a white cowboy hat, posing for the cluster of photographers like a pro as he walked his family’s 5-month-old Australian shepherd Chris — a rescue adopted from the Humane Society of the Desert. 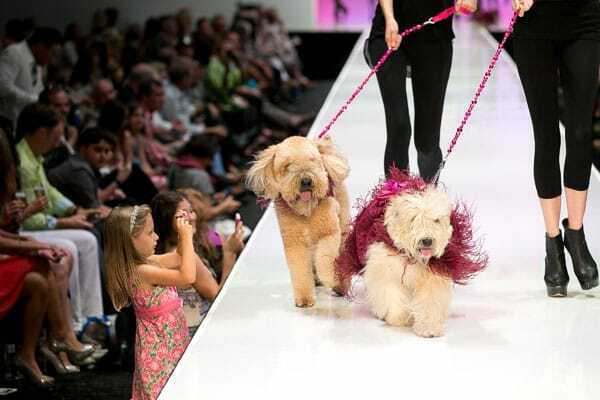 In addition to professional models, the donors who walked with their dogs included Lindsay Sangalli with her two Westies wearing pink and blue hair accents. 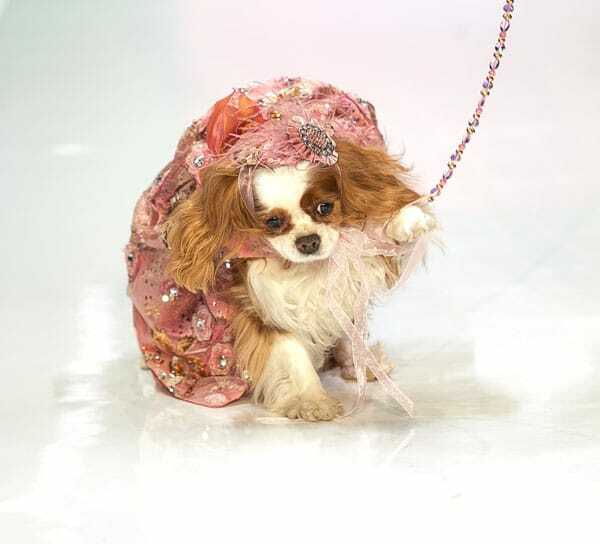 Dr. Agnes Montz's French terrier in an apricot check Jackie “O” Chanel-like ensemble. 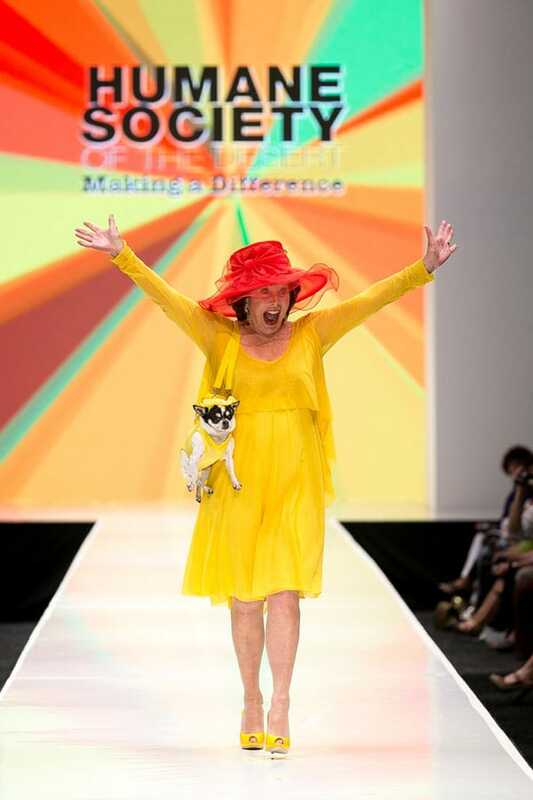 And Lindi Biggi, who carried her pup in a tote that matched Biggi’s yellow Fuzzi dress and contrasting summer hat. 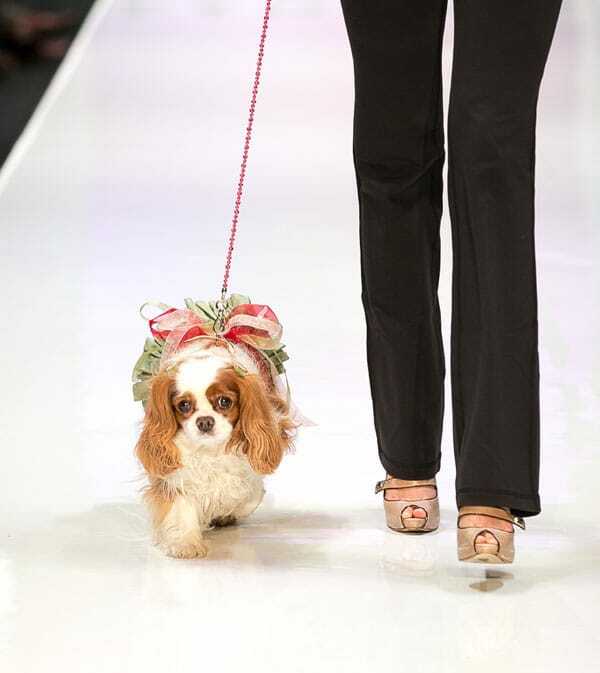 Designer Linda Higgins provided the 40 canine couture outfits selected for the show, which reflected fashion themes of lunch and tea parties, biker chic, cocktail and prom, and evening and formal wear. Higgins made each one-of-a-kind piece by hand in a process she says took about seven months. “It’s a labor of love,” she said after the show. And love it everyone did. 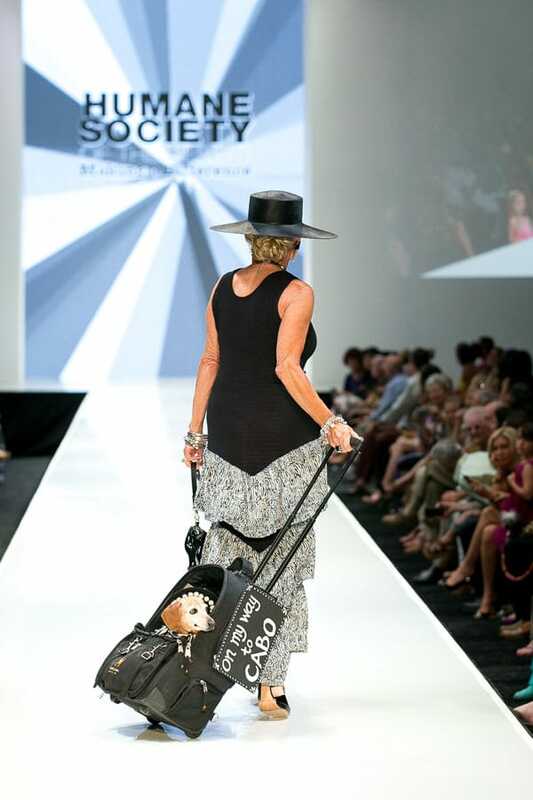 A one-hour cocktail reception preceded the 6 p.m. show with a silent auction, live music, and other surprises. People cookies shaped like dog bones were provided compliments of Bakery Underground. 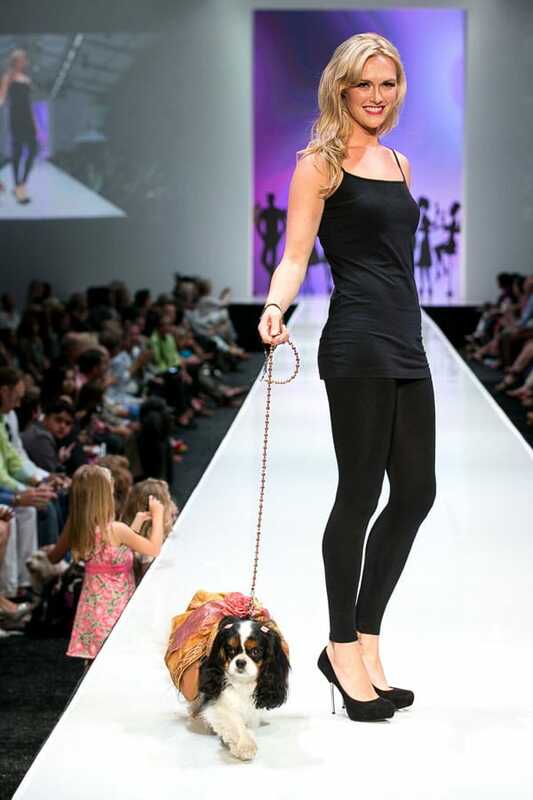 Fashion Week El Paseo continues through March 23. 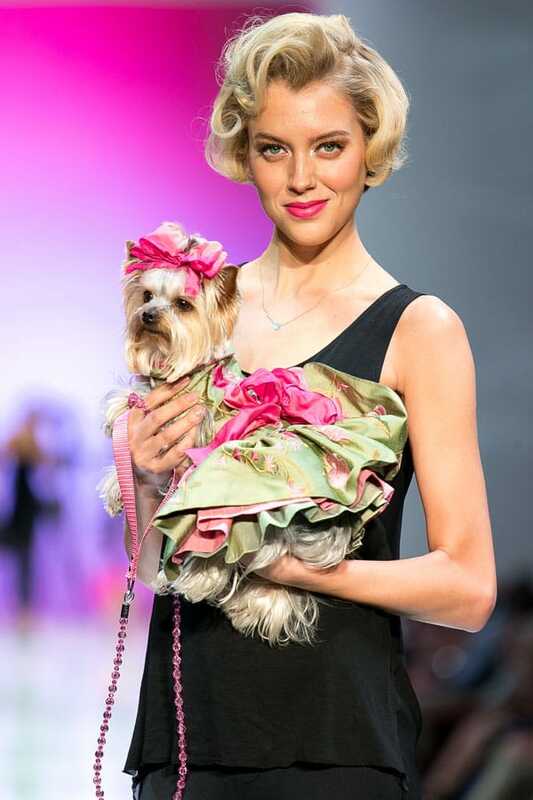 Fashion Week El Paseo™ presented the second annual Le Chien Couture Fashion Show, Saturday, March 16, 2013. 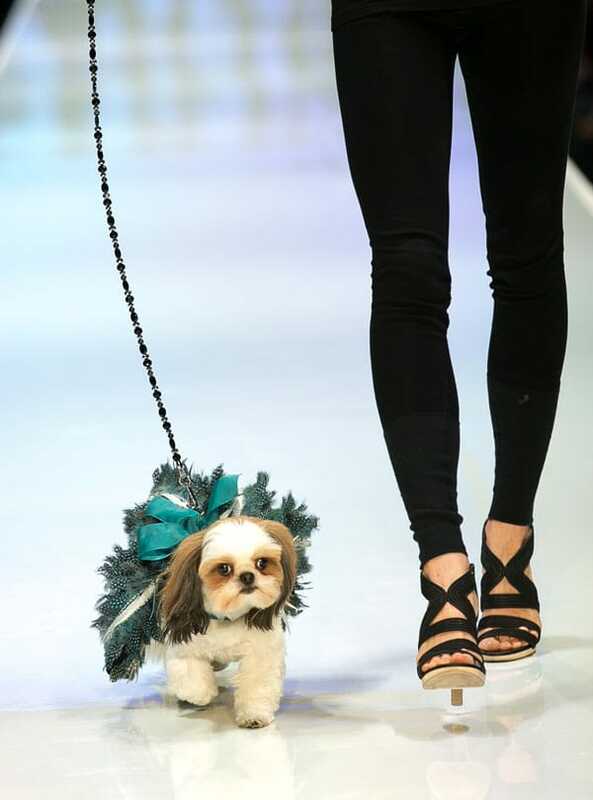 Attendees saw large and small, pedigree and mutt strutting their stuff on the Fashion Week runway in the Big White Tent. 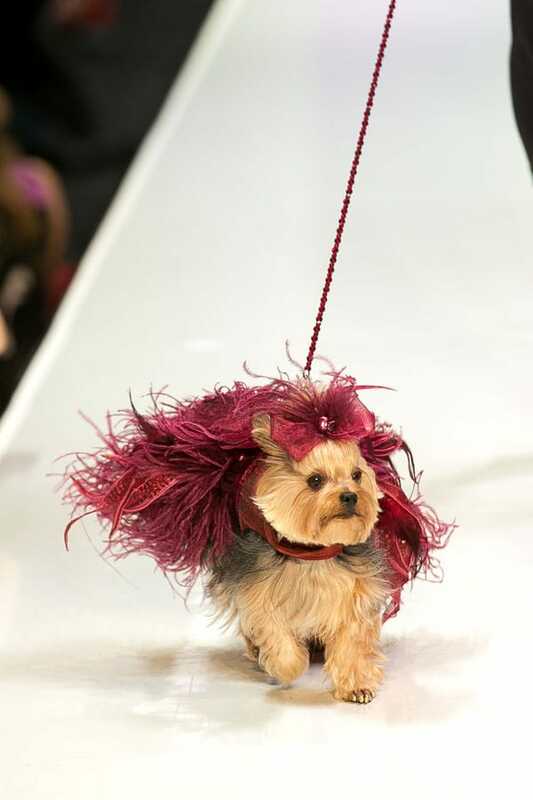 The doggie models were all be decked out in the latest spring fashions by dog couture designer Linda Higgins. 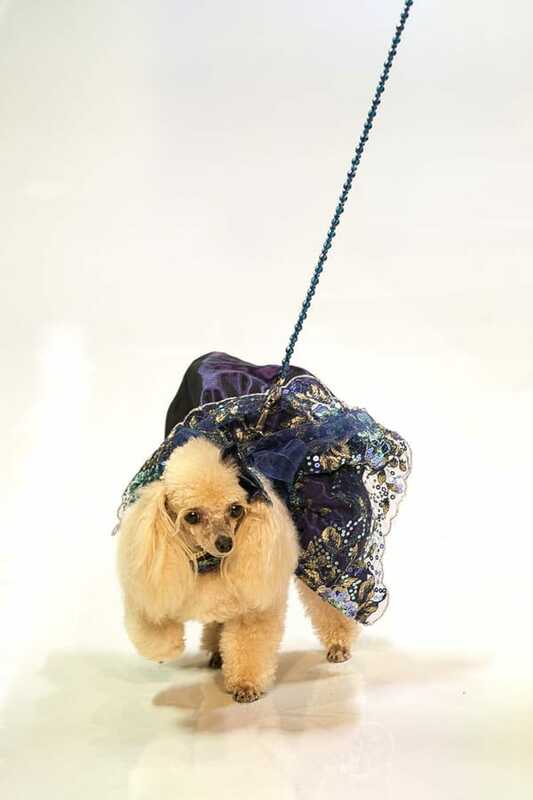 Fashion Week El Paseo™ presented the second annual Le Chien Couture Fashion Show, Saturday, March 16, 2013.